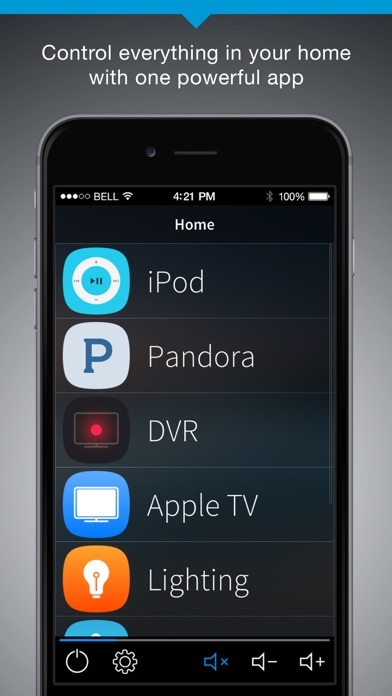 Take control of all your entertainment and home systems from your iPhone and iPod Touch. Crestron offers many solutions to integrate the different systems within your home so that they all work together to make your life more convenient. 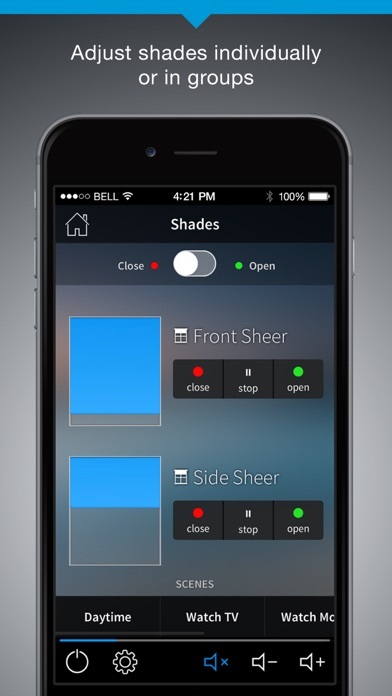 Download this app if your system takes advantage of Crestron’s Smart GraphicsTM. With the touch of one button you can turn off every light in your home, share music throughout each room, adjust the temperature, set the alarm, and more. Integrate TVs, music, lighting, shades, door locks, security, heating and cooling systems and control them all from the device you always carry. The Crestron App communicates via W-Fi or 3G to keep you connected while at home, at the office or anywhere in the world. 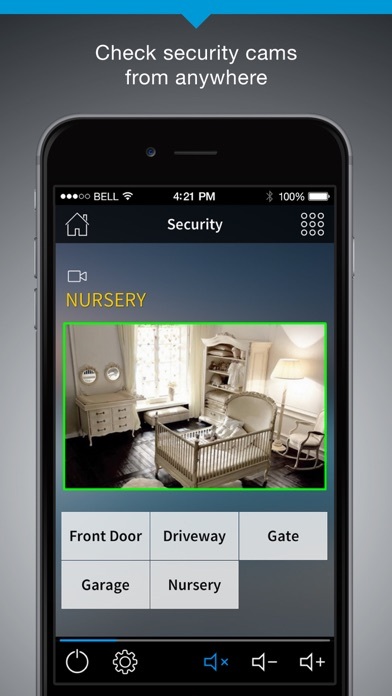 The Crestron App talks directly to a Crestron home control system implemented by an authorized dealer. Use the GUI you see here or create your own custom one. When it comes to your home and your life, you don't settle for anything but the very best. You want everything to be complete, easy and worry-free. 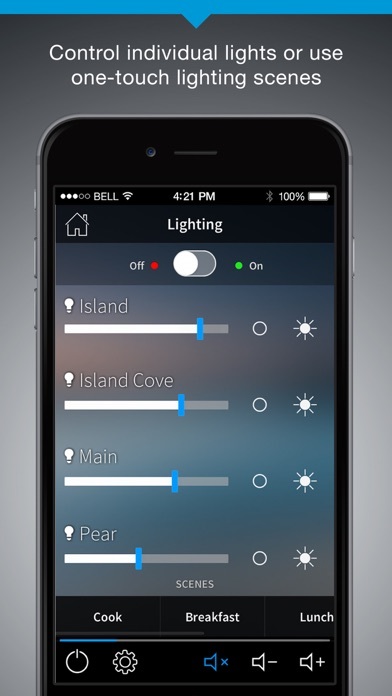 That's what a true home automation solution should be, and that's what you get with Crestron. Easily control everything in your home, room-by-room, using our ultra-cool touch screens and remotes, or anytime, anywhere from your favorite smart device. Don’t listen to other reviewers that say their system doesn’t work. You need a good programmer and integrator to make Crestron work properly. Each system is unique and different and it programmed as such. Don’t blame Crestron for a poor programmer and integrator. Also you need a solid network for it to work properly. Have never had a single issue with this system as I am a programmer. Sick of complainers that don’t know how great Crestron is and blame Crestron. Programmers and installers make Crestron look bad. I’m giving it 4 stars only because it is not optimized for IPhone X yet. I’m sure it will at some point. I have tried everything possible to set up control of my lights with this app thru Amazon Alexa and it simply does not work. I am able to control my Sonos music system as well as my Lutron shades with Alexa with no problem at all. My friend has a Lutron Caseta lighting system in his house that works with Amazon’s Alexa home control beautifully. For the cost of Crestron’s products it’s amazing that they don’t make their products work with other systems. They must make their products compatible with Alexa or Google Home control units or they will become obsolete in this industry. I hope they do as I have invested a lot in their systems, but if they don’t soon, I will be switching everything to Lutron as they work great with these home control systems like Alexa and Lutron has seen the “light”. My app does not respond in the security setting. My husband is able to use the security feature on his app so it is not an issue with our system. It’s very disappointing for $100 app to not work properly. Especially when we had to each buy the app due to us having different Apple ID. It would not allow family share which is utterly ridiculous. So am I now supposed to buy 2 more apps because I have teenagers??? Not happening. The system itself comes with a hefty price tag so this is just highway robbery. I won’t be recommending this product to anyone. I have a few things I like to control when I’m away from my home. 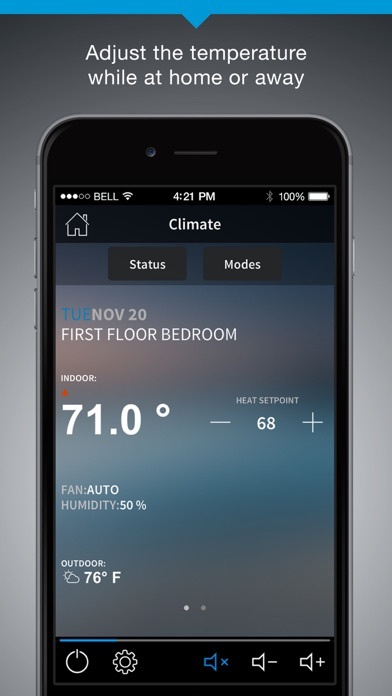 This app allows me to have a simple interface for those specific things, like “did I lock my front door?” or “did I turn off the HVAC?” I like having the ability to be able to control what I want, and remove what I don’t want, so the interface is clean and simple. It’s easy, fast, and it always works. Atualizei o App e parou de funcionar!!! This app is really useful when it comes to forgetting if I left my lights on. Works well with my Crestron automation system. I'm able to access multiple systems from one app! The programmer did a great job, it works just like my other touch panels in the house. I have no issues with local files, and loading. The programmer loaded the graphics file directly to the processor. I can use any iPad, and updates are automatic! The app works well except for one significant problem. As an end user, if I use a local file and there is an update to the user file, it requires a reload of the local file by your automation company. If I do not use a local file, the app hangs unless you have a very strong wireless signal. Crestron needs to allow the user to switch a non-local file to local usage to avoid this or open up file sharing so the end user can load the local file to a new device or when there is an update to the user file. This is another way that crestron is not end user friendly. Since I've made this last update on my iPhone it is not working. Does not load interface. Thank god I didn't updated my iPad, so I can still control lights in my house. Please, fix it!! !